As the Green Bay Packers starting QB the past five seasons, Aaron Rodgers has definitely set a standard that will be hard to duplicate when he hangs up his #12 uniform. Whether it’s TD passes, a career passer rating over 100, or a 52-26 regular season record as the Packers starting QB, Rodgers has put some eye-opening numbers on his professional football resume. Here’s another one to consider: Rodgers this year became the first QB in NFL history to have two seasons where he was sacked 50-plus times but compiled a passer rating of 100 or more in that season. 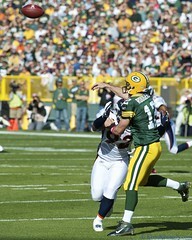 This year Rodgers was sacked 51 times and had a passer rating of 108. In 2009, Rodgers was sacked 50 times yet still had a season passer rating of 103.2. Nine times there have been NFL quarterbacks who were sacked 50 or more times in a season yet the QB was able to compile a passer rating of 90 or above. With his 108 passer rating this year with 51 sacks, Rodgers now has the highest season passer rating of any NFL QB with 50-plus sacks. Here’s a look at the QBs who have had a passer rating of 90 or above in a season when they were sacked 50-plus times. * Rodgers was the only QB to get sacked 50 or more times this season. No QB was sacked 50-plus times last year. The only QB to get sacked 50-plus times in 2010 was Jay Cutler of the Bears who was sacked 52 times. * David Carr holds the NFL record with 76 sacks in 2002 when he was the Houston QB. * Rodgers’ 39 touchdown passes this season is the most by a QB who was sacked 50 or more times in a season. The previous high was 36 by Steve Beuerlein in 1999. * Rodgers’ 67.2 percent pass completion rate this season is the highest of any QB who was sacked 50 or more times in a season. The previous high was 66.6 percent by Ben Roethlisberger in 2009.